In case you haven’t listened to the latest episode of Wood Talk, part of the discussion with my co-hosts was in regards to books that “inspire us”. I’m not ashamed to admit it (okay, maybe a little) but I almost didn’t have any titles to share. In fact the only one worth mentioning was my copy of Jim Tolpin’s Woodworking Wit & Wisdom . It’s not that I DON’T get inspired to create projects, because I do! When I see objects I like, I find myself deconstructing them in my mind. “What kind of material would I use?” “What joinery would work best?” “What would I add or subtract to make it fit my need?” These are just a few of the questions floating around in my head when I decide I want to build something. Unlike so many of the artistic and creative friends in my life, inspiration isn’t something that comes easily. I have to work at it and struggle and make A LOT of mistakes along the way. Often, the final product isn’t anywhere near what the original idea started out as. Which can be both exciting and very frustrating! In other words; for me to achieve a sense of inspiration I have to endure a great amount of perspiration, both mentally and physically. So I’m posing a question to all of you. 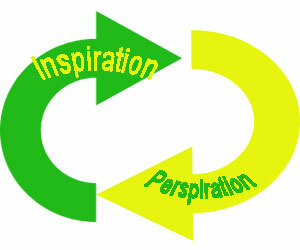 Where does your inspiration come from? Does it naturally ebb and flow from you like a river? Is it in the pages of a book? Is it in every piece of furniture you lay your eyes on? Or do you have to perspire like me to finally realize it? I surf through Lumberjocks projects pages and get ideas for stuff I’d like to make. Necessity provides the other ideas. Since this is a hobby for now, I don’t have much of a rush on anything and it really doesn’t matter. Hopefully someday I can do this full time but for now I can take it easy. The process of making something and solving the problems of joinery or finishing or style is something I actually enjoy. My only perspiration is when I get impatient and think a particular project is taking too long. I’ll get over that someday, hopefully soon. I wish I’d get over my impatience with projects LOL!!! Interesting question: I wonder how much experience plays into the equation. As a new woodworker (9 months), I quickly caught the bug and have had no shortage of amazing designs to investigate. From the Internet, books, furniture stores, museums – a whole new world of design that I wasn’t aware of has opened as I’ve started to understand the process and build skill. For me, a cutting board is inspirational – the fact that I can make something is still cool. Maybe in 10 years I will have to look harder for interesting things to build, but at the moment my hands and schedule can’t keep up with my ever growing project wish list. Matt – I just saw your video for the 6 pack holder: great idea! Had never thought to make something like that out of wood. Consider me inspired. Inspiration, as I see it, is a matter of stuff, time and experience. As a woodworker and teacher, stuff inspires me – the more and higher quality the materials, the more ideas go. I also need time. Ive been thinking about most projects of mine for years before i get to them. In the classroom, every hour teaching represents three to five hours of development time (four classes a day. inspiration can lead me because im so well prepared. Lastly, experience. The reason why artists and craftsmen are so good is the hours spent honing their craft. Inspiration can take seed in such ground. Im a far more inspired intermediate woodworker than i was a novice. Your way, Matt, sounds like it fits right on in.